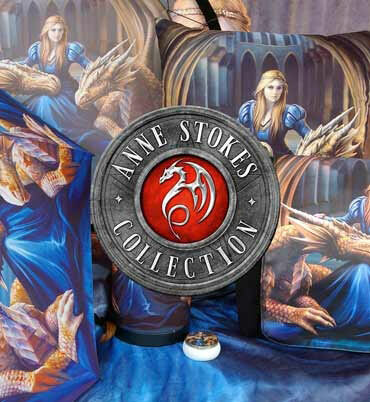 Exclusive to Nemesis Now, this enchanting shoulder bag comes from the wild and untamed imagination of globally renowned Gothic and alternative artist Anne Stokes. In a grand hallway, sturdy pillars flanking the marble-floored corridor, a young red-haired woman sits on the ground, a golden diadem around her head betraying her noble origins. Her long blue dress flows across the floor, and sitting either side of her are two copper-coloured Dragons. They curl protectively around her, the one to her right nuzzling her lovingly, as she rests her hands on their heads as if they were her pets. She holds your gaze, unblinking and unafraid. Behind her, high arched doors tower, the windows of a gallery above them. This shoulder bag has a smaller front pocket in addition to the main pocket for greater ease and flexibility of storage, as well as an adjustable strap, making it perfect for anyone who wants the protection of fierce Dragon pets on the go.